Blacksea Interactive’s Imnia is now on Kickstarter. Imnia is a medieval strategy game where each player builds up their own town to finally win by constructing an impressive Wonder. Buildings in your town will give you more resources, more actions, items, characters, and the ability to construct higher level buildings. With all those you improve your reputation and, in the end, construct three stages of your wonder. You have a lot of options in Imnia, so you won’t run out of strategies to try in a hurry. It’s been twenty years since Victor Frankenstein built his creature. Despite Captain Robert Walton’s oath and best effort the creature is still at large, and it’s lonely. Going back to his roots, the creature hires a selection of scientists with flexible morale boundaries to create a companion. And that’s where you enter the scene in Plaid Hat Games’ Abomination: The Heir of Frankenstein. Via good, old worker placement you gather the energy needed for reanimation, find additional sponsors for your work, and, of course, collect pieces for your new creature. It’s for this unsavory endeavor that you have the most options, because from shopping at the slaughterhouse to outright murder everything is possible. Depending on your actions it’s not only Captain Walton you have to worry about, you also have to keep your own humanity intact. Not the easiest task in this business. You are still rolling dice. You are still collecting income, you are still racing to build landmarks.. but then you unlock the [Censored] and you start earning a little extra income by [Censored], and then you start to explore the [censored] and you have to make a choice between [censored] and [censored]. Even if you aren’t in contention to win a given game you still have [censored] to set up exciting [censored] for the next one. And then the [Entire paragraph deleted]. I’m sure glad we got that cleared up. Guess I’ll have to play to find out more. Valley of the Kings is a deck-building game by Tom Cleaver and Alderac. We reviewed it a few years ago and were rather happy with the game of cramming the most stuff into your pyramid before you die. The reason I’m bringing it up again is not a new expansion – although I wouldn’t object – but because Alderac have launched a Kickstarter for a deluxe edition. In one box you will get Valley of the Kings and its two mix-in sequels Afterlife and Last Rites, all with high quality, larger size cards. You’ll also find two entirely new types of cards: pharaoh cards give each player starting powers, while unique cards work more like traditional Valley of the Kings cards, but they’ll be unique. Upgraded components never did much for me, but all three games in one box, plus new extras? That’s tempting. Ticket to Ride doesn’t need much of an introduction. Collect sets of cards in the same color, put trains on board connecting cities, complete routes to earn points. Ticket to Ride: New York was the first adaptation of Ticket to Ride to a smaller, quicker game. A smaller board, taxis instead of trains, and you play a game in ten to fifteen minutes. 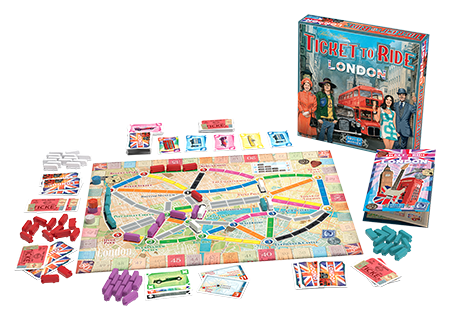 Now that mini-Ticket to Ride has spawned its own series, continued in Ticket to Ride: London. And instead of trains, what would you have in London if not the famous double-decker buses? I’m not sure if I’ve ever been as curious about a trick-taking card game as I am about Renegade Game Studio’s Time Chase. 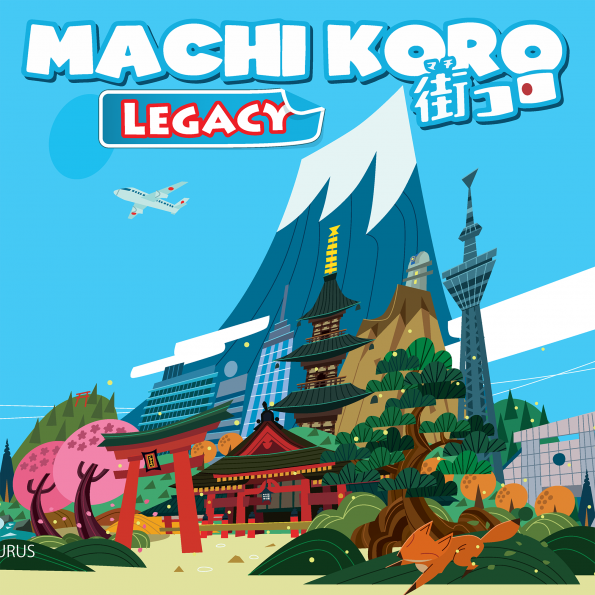 It’s a trick-taking game with time travel. You can travel back in time to earlier tricks and change their outcome. That’s crazy! How is that even going to work? I don’t know, all I know is that the first player to win three tricks wins. Running an art gallery is a rare theme in boardgames, and you don’t always have time to play The Gallerist. If you want to build a gallery in thirty minutes Artsee might be what you’re looking for. It focuses on curating the art collection for your gallery’s four wings using a card drafting mechanism. If you attract enough visitors and collect enough prestige you may even acquire some masterpieces for your collection. A game about attracting butterflies to your garden sounds light and non-confrontational, doesn’t it? Well, that doesn’t quite seem to be the case for Kolossal Games’ Papillon. You start each round with an auction for going first in the subsequent drafting phase. Then you pick a whole row or column of tiles that have different numbers of tiles to start with and where your choice will take tiles from the lines the other players choose. Then you fit all those tiles into your garden. When you complete an area of flowers you place a butterfly there that you may later move to the big flower standee of the same color. Majorities on these flowers are what scores points. None of the steps is particularly complicated, but with all of them together Papillon is not really a light game, and it has multiple levels of interaction to outwit your opponents. 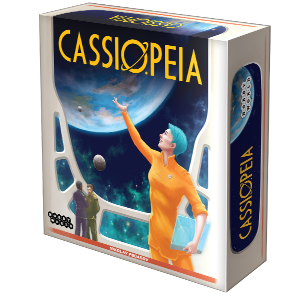 Science-fiction games are still somewhat rare compared to fantasy settings, so I was happy to hear about Cassiopeia, a new game by Hobby World where you terraform planets. Cassiopeia uses double-sided cards to great effect. First, you have the specialist cards. Each player picks one of these to determine player order and select their special action for this round. At the end of the round, all specialists that were chosen will be flipped over to show a different character. The planet cards are double sided as well. You may flip those to their terraformed side by paying the price given on the planet card to their left. Terraforming a planet activates its special ability, but it also makes you more vulnerable to opponents’ offensive specialists. Oh, and it might change the price for the next planet, too. That all sounds really good. Strategic, but not super heavy. However, there is one thing that disturbs me: Why are all the planets on the info sheet named after Lovecraft creatures? Artline is a shedding game, but absolutely not the usual kind. Shedding games are those where you want to be the first to rid yourself of all your cards. The cards in Artline have no suits and no values. All they show is artwork from the State Heritage Museum in St. Petersburg. So, based on what do you shed those cards? You basically make that up yourself. You play cards in a grid on the table, and for each row and column you come up with a feature all paintings there must share. Dogs. Bright green. Someone looking to the left. Anything goes, really. When you start a new row or column you have to draw a new card. If you can place a card at an existing intersection, then you don’t. A very fun way to implement shedding with image association, and it’s pretty, too. I wouldn’t be surprised to see edition from art museums around the world. It’s not easy becoming king. Especially not when all the craftsmen work for other tribes, without them your monuments don’t grow and even your gods make it harder for you to win. You’ll have to do a lot of thinking to rule over The Great Zimbabwe. “Kill Doctor Lucky” is not only the name of the game, it’s also the only victory condition. Be the first to strike down the old academic in this fun little filler game. Trains, pick-up-and-deliver mechanic, set collection. All that doesn’t sound new, the mechanics have been used and even combined before, and there are more than a few train games out there. But Cargotrain takes those simple ingredients and mixes them up into something tasty and fun. The Crusades, the attempt to conquer Jerusalem for Christianity, were a bloody period of war. They’re a prime setting for wargames – I’m sure a few have been made – but finding a card game in the setting did surprise me. With a unique illustration style and a simple area majority mechanic, it’s an unusual take on the Crusades. The way from Europe to the western coast of the US and Canada used to be one of the hardest. You either unloaded everything and travelled by land, or you went all the way around Cape Horn, at the tip of South America. Not a fun trip. There had long been speculation that a passage exists around the north of the continent, but many set out to find it, and for a long time they returned without success. And then, when someone finally managed to go all the way by boat, it still was hard, and dangerous, and the Panama Canal opened just a few years later. But they did find the Northwest Passage. And so can you. When the call comes in, everything has to happen quickly. Slide down the pole, get on the truck and of you go. Yes, you can now experience the thrill of firefighting in a board game – minus the pole – in Indie Boards and Cards new cooperative game. Consumable games, games that you play a number of times and then they are over for you, are a new thing. Pioneered by Risk Legacy, the idea has spread. More games are coming with the Legacy system, but that’s not the only way to make a game “expire”. T.I.M.E. Stories tries a different approach, one that leaves the game material unchanged and changes what you know instead.